Product prices and availability are accurate as of 2019-03-20 04:27:33 UTC and are subject to change. Any price and availability information displayed on http://www.amazon.com/ at the time of purchase will apply to the purchase of this product. Ultraman Kaiju Ultra Monster Series # 11: RED KING. "Skull Monster" soft vinyl toy action figure from the Japanese TV series "Ultraman". Invite to the terrific world of Ultraman Kaiju, the amazingly diverse and colorful monsters that occupy the numerous Ultraman TV series and motion pictures that have actually been produced in Japan throughout the years. 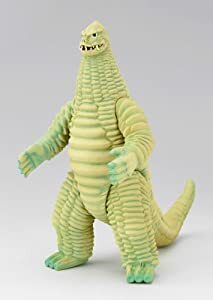 The Ultra Monster Series of Kaiju produced in Japan by the world's largest toy company, Bandai, are soft vinyl toy figures based on these monsters. A highly-detailed and colorful action figure with several points of articulation. An accurate reproduction of the Kaiju monster as seen in the Ultraman TV show or movie. A cultural icon and a best-selling toy in Japan. Made by Bandai, the world's largest toy company. One in a large collection of strange and wonderful Kaiju creatures. Collect them all!